Steel King light-duty cantilever racks are economical racks used in hand loading situations only. 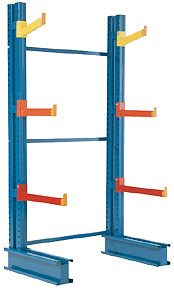 Manually accessed loads are stored easily and securely in these industrial storage racks. Don’t mistake light duty for "light" construction. Steel King doesn’t cut corners on structural integrity. Like all other Steel King cantilever racks and industrial storage systems, the light duty cantilever racks are designed, engineered, and manufactured to ensure that you get top quality from the leader in warehouse and industrial storage racks.